The world of the ancient Greeks – the larger-than-life characters of its myths, the ritualized formal structures of its drama – have fascinated composer Harrison Birtwistle since his student days. Even the early masterpiece Tragoedia (1965), reflects this absorption, with its re-creation of the structures of Greek tragedy in abstract instrumental terms. Birtwistle’s first Orpheus-inspired work came just five years later: Nenia: the Death of Orpheus, a powerful lament for soprano and chamber ensemble. These two have been followed by many instrumental works and songs similarly inspired by the Greeks, most famously Panic (1995), Theseus Game (2003) and Orpheus Elegies (2004). Many of Birtwistle’s stage works reflect the same obsession. As Music Director of the National Theatre 1975–83 he was able to immerse himself deeply in Greek tragedy with music for Peter Hall’s production of Aeschylus’ trilogy Oresteia in 1981. The project cemented Birtwistle’s interest in ancient Greek theatrical rituals, and has had far-reaching implications – both for Birtwistle’s operas, and his second collaboration with Hall in 2002, on The Bacchae. Birtwistle’s first large-scale opera The Mask of Orpheus in 1986 was his first operatic treatment of a Greek myth. He wished to ‘create a formal world that was utterly new’, and this complex opera, scored for vast orchestra, 14 soloists, chorus and dancers, radically explores the different versions of the Orpheus myth and their contradictions. An elaborate stage design demarcates areas of the stage for different actions; Orpheus, Eurydice and Aristeus (Eurydice’s other suitor) are performed not only by singers but also by dancers and puppets, in a representation of their human, heroic and mythical forms. The final act offers several alternative endings to the myth. Birtwistle returned to Orpheus in The Second Mrs Kong (1994), this time placing him in a fantastical contemporary setting. Librettist Russell Hoban felt that transporting Orpheus into the modern world articulated the ‘ungraspability’ of reality: a key theme of the opera, in which the mythical musician (and, after he is brutally decapitated, his singing head) accompanies the giant ape King Kong on his quest to find Vermeer’s ‘Girl with a Pearl Earring’. Ultimately Orpheus’ loss of Eurydice parallels Kong’s final failure to embrace Pearl. Birtwistle’s ninth opera The Io Passion (2004) offers another postmodern treatment of Greek myth. 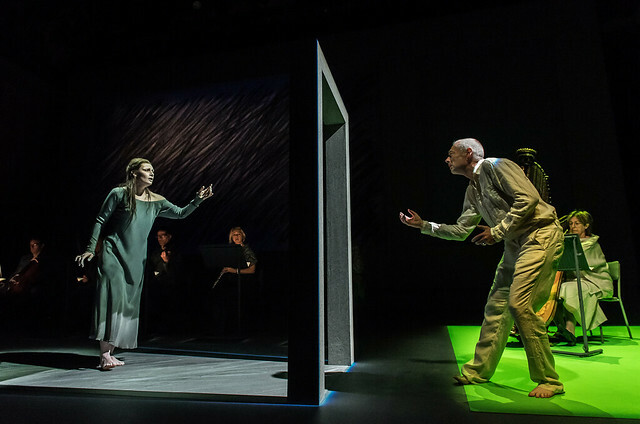 The story of Io – Zeus’ lover, transformed into a heifer by his wife Hera – gradually permeates that of two modern estranged lovers, until, in the words of librettist Stephen Plaice, the story ‘bursts up through the routine surface, and presents itself in its raw power’. The Minotaur from 2008 is in some ways more straightforward but no less original. Birtwistle and librettist David Harsent present a strikingly humane treatment of the fearsome man-bull. The Minotaur may be a brutal killer, but he’s also a melancholy, even sympathetic figure, who laments his loneliness in poignant soliloquies. Birtwistle and Harsent contrast the ultimately sympathetic Minotaur with his unscrupulous half-sister Ariadne, who lies, cheats and betrays in order to escape her life on Crete, and the ‘hero’ Theseus, who ill-treats Ariadne and who murders the Minotaur out of vanity. Birtwistle returned to Orpheus again in The Corridor (2009), another collaboration with Harsent. This intense chamber opera focuses entirely on the moment when Orpheus looks back at Eurydice on their journey from the Underworld, and so loses her forever. In thirty minutes, Birtwistle and Harsent explore every emotional aspect of that moment – excitement, despair, anger, grief, resignation – and offer a complex reading of the couple’s relationship. Six years on, Birtwistle and Harsent have captured another moment from Greek myth in The Corridor’s companion piece The Cure: the sorceress Medea’s rejuvenation of the dying King Aeson, father of her lover Jason. Together, these two potent operas – each explorations of damaging intimacy and of the value of existence – testify to the lasting spell that that ancient Greece holds over Birtwistle, and over his audiences. The production is a co-production and co-commission with Aldeburgh Music, with additional support from the London Sinfonietta, and is generously supported by The John S. Cohen Foundation and the Boltini Trust.